I’m sorry Blake Lively and Ryan Reynolds, but Emily Blunt and John Krasinski are the cutest couple in Hollywood. 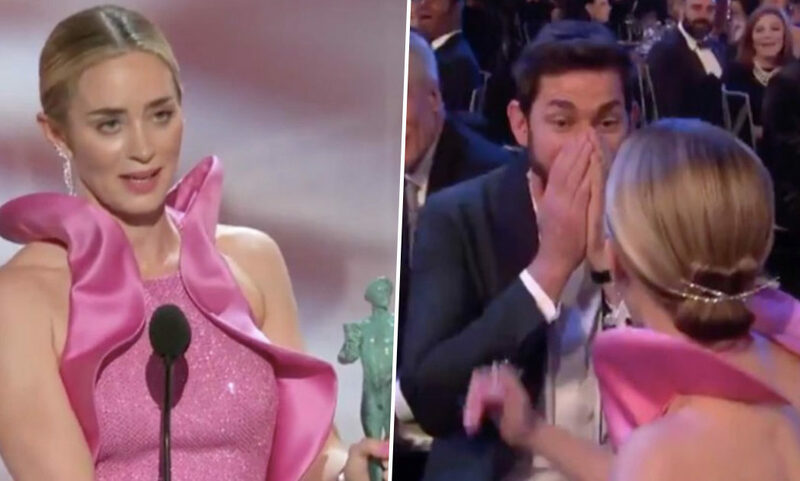 And Krasinski’s reaction to Blunt winning her first ever Screen Actors Guild Award (SAG) last night (January 27) is all the proof you need to back this statement. The 35-year-old beat out fellow nominees fellow nominees Amy Adams (Vice), Margot Robbie (Mary Queen Of Scots), Emma Stone (The Favourite), and Rachel Weisz (The Favourite) to win ‘Outstanding Performance by a Female Actor in a Supporting Role’ for her performance in last year’s horror film A Quiet Place. When Blunt’s name was read out by Chris Pine, who was presenting the award, the actor was clearly shocked, yelling ‘what’. Reaching out to her husband of nine years, Krasinski, who was sat next to her, Blunt gave him an excited hug before leaving for the stage. Looking on, Krasinski stood up, applauded and loudly cheered on Blunt making this viewer’s heart melt. In her acceptance speech, Blunt shared the award with Krasinski who wrote, directed and also starred in A Quiet Place. Oh my goodness me! Guys, that really, truly has blown my slicked hair back. Thank you so, so, so much, I’m so moved and completely lost for words and unprepared. I am going to share this completely with my husband John Krasinski because the entire experience of doing this with you has completely pierced my heart directly. You are a stunning filmmaker. I am so lucky to be with you and to have done this film with you. Thank you for giving me the part. You would have been in major trouble if you hadn’t. So you really didn’t have an option, but thank you. And thank you to the two little poems in our life, our daughters Hazel and Violet who will be to be at least 45 before they can see this film but they will be proud of you nonetheless. Blunt was also nominated on the night in the ‘Outstanding Performance by a Female Actor in a Leading Role’ category for playing the lead role in Mary Poppins Returns. She lost out to Glenn Close for her performance in The Wife. Ahead of the Oscars, Black Panther won big at the SAG Awards yesterday picking up both ‘Outstanding Action Performance by a Stunt Ensemble in a Motion Picture’ and ‘Outstanding Performance by a Cast in a Motion Picture’. Last week the Marvel film became the first ever comicbook or superhero movie to receive a Best Picture nomination at the Academy Awards. We wish the film all the best on the night. The 91st Academy Awards takes place on February 24.